Amid all the buzz about personalizing learning, what can we learn from schools getting great results? 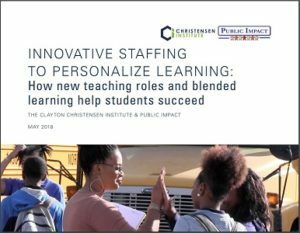 In a new report, Public Impact and the Clayton Christensen Institute analyzed eight schools and school networks that are not only personalizing learning, but also getting strong learning results with disadvantaged students. What’s different about these schools compared to the norm? 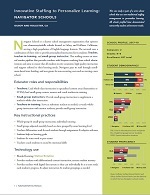 New staffing models combined with blended learning. In these schools, blended learning does not replace teachers. Instead, it augments the ability of multiple adults to understand and meet the needs of individual students in a collaborative workplace. Research about Public Impact’s Opportunity Culture initiative has already shown positive student learning gains in district schools where multi-classroom leaders lead small, collaborative teaching teams, many of which use digital tools to keep track of student progress. Here, we look at other efforts as well. Brooklyn Laboratory Charter Schools (LAB) provides personalized instruction using a combination of four teaching roles: lead teachers, learning specialists, resident teachers, and fellows. Lori Treiber and Scott Nolt are blended-learning teachers at Central Cabarrus High School and Jay M. Robinson High School, respectively, in the Cabarrus County (N.C.) Schools district. Each uses a mix of in-person teaching and online learning—either at home or school—to reach twice as many students within a specific class period as they would otherwise. In the “Franchise School” model in Clark County School District, the schools led by Principal John Haynal use three main educator roles: subject-specialized lead teachers, certified temporary tutors (CTTs) who monitor online learning, and growth analysts who monitor student data and work with teachers to ensure student progress. The schools are led by a single Franchise principal, with one assistant principal leading each school. CICS West Belden, a K–8 charter school that is part of the Chicago International Charter School network, provides personalized instruction using a combination of online learning, small-group instruction, peer-to-peer learning, and whole-class instruction. Adults from four different roles di­rect students’ learning experiences: instructional coach, mentor teacher, career teacher, and resident teacher. Check back soon for accompanying videos. Cristo Rey San Jose, a private high school in San Jose, California, is part of a network of 32 Catholic schools focused on preparing underserved students for college. The school uses co-teaching, differentiated teaching roles, tutors, and online learning software to personalize its math courses according to each student’s needs. Intrinsic Schools provides personalized instruction using a combination of online learn­ing and team teaching in math and English. The Chicago charter school’s staffing arrangement gives students personalized instruction and supportive relationships from multiple adults, while fostering teacher development through co-teaching. Navigator Schools uses a combination of three roles to provide personalized instruction for its students: Teacher, teacher-in-training, and small-group instructor. Ranson IB Middle School, an Opportunity Culture and International Baccalaureate school in the Project L.I.F.T. zone of Charlotte-Mecklenburg Schools, provides personalized instruction using a combination of multi-classroom leaders, small-group teaching, online learning, and a focus on in-the-moment instructional adjustments according to each student’s needs.